A democratic political culture cannot be created or renewed overnight. It takes a lot of time and in the meantime there are plenty of unanticipated problems to be solved. Communism ruled just once in modern times (and, hopefully, for the last time), so the phenomenon of post-Communism was also a novelty. We had to confront the consequences of the rule of fear that lasted for so many years, as well as all the dangers related to a redistribution of property without precedent in history. So there were and are lots of obstacles and we are only now acquiring experience of such a state of affairs. Months earlier in the summer of 1989 Jiří Křižan and Václav Havel had drafted "A Few Sentences" Petition calling for the release of political prisoners and respect for human rights. 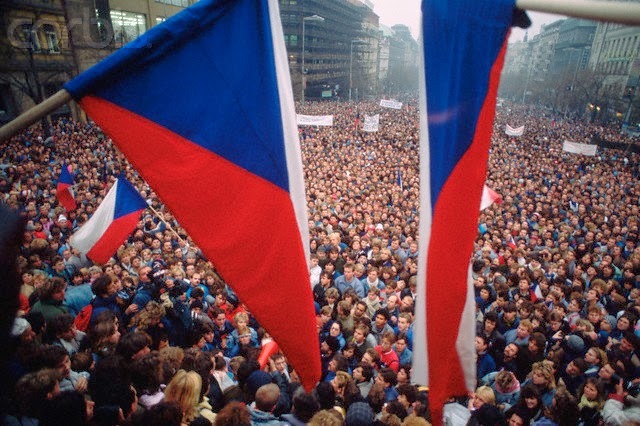 Tens of thousands of Czechoslovakians signed the petition and it contributed to the Velvet Revolution and the fall of communism in Czechoslovakia. What took place on November 17, 1989 was the nonviolent triumph of the power of the powerless over a brutal totalitarian regime.This is in profound contrast to the centenary of the start of World War One that was supposed to make the world safe for democracy and instead ushered in two totalitarian systems: Nazism and Communism, a Second World War and a Cold War. The Velvet Revolution was not inevitable, but a combination of providence, free will, and principled human action. The "Velvet Revolution" achieved profound non-violent change without wholesale slaughter and violence associated historically with revolutions. 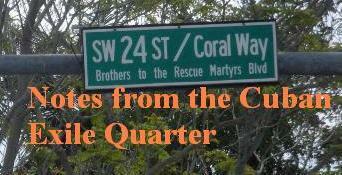 A cursory look would claim that the "revolution" took 11 days in November for the Communists to relinquish power. Some say it began in 1976 after the beating and arrest of the rock band the Plastic People of the Universe led to a number of intellectuals, Vaclav Havel, among them drafting and signing Charter 77 challenging the Czech communists to honor the rights outlined in their own constitution and in the Helsinki accords which the communist government had signed in 1975. The era of dictatorships and totalitarian systems has not ended at all. It may have ended in a traditional form as we know it from the 20th century, but new, far more sophisticated ways of controlling society are being born. It requires alertness, carefulness, caution, study and a detached view. I've had the privilege to have walked the streets and breathed the air of Prague in May of 1990, barely five months after Havel went to the Castle in December of 1989, and returned nineteen years later in October of 2009 to participate in Forum 2000 and see the changes that had taken place. Although Czechs may no longer look in awe at all that they have accomplished after walking around the center of the city visiting shops and a grocery store, and talking with Czechs over a few beers I left impressed by all that had been accomplished, and with an overwhelming sense of happiness at bearing witness to a flowering of freedom and creativity that continues to endure and thrive. Victims of dictatorship the world over have experienced first hand the solidarity of the Czech and Slovak peoples. Further evidence that 25 years later the ideals of the Velvet Revolution endure. 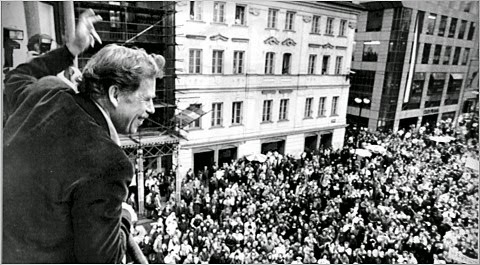 Vaclav Havel greets crowds in Wenceslas Square during 'Velvet Revolution'. The New York Times: A Propaganda Rag?